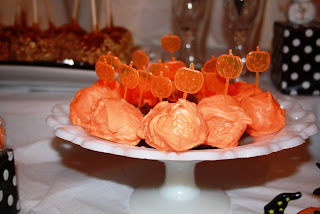 A blog dedicated to crafty ideas and party ideas. We had a Visitor when it was time for the cake. 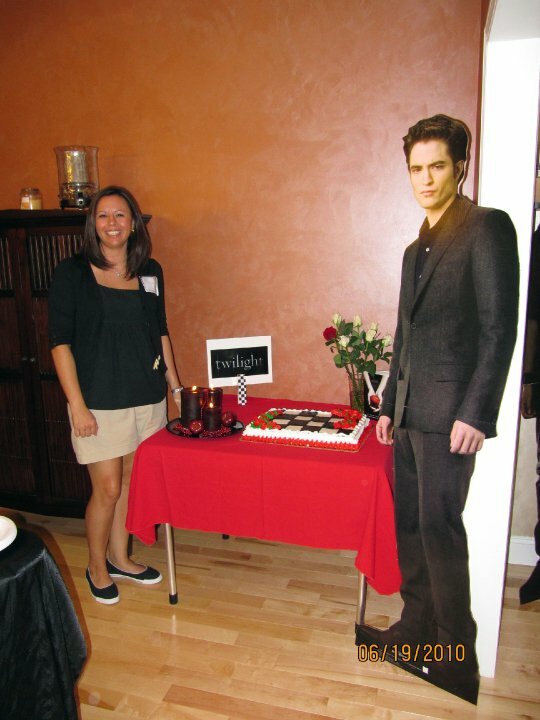 We lucked out that the bride to be had an Edward cutout that we conveniently borrowed just minutes before the party. This sign welcomed guest on the front porch and let the bride get a taste of what the "suprise theme" was going to be for her bridal shower. 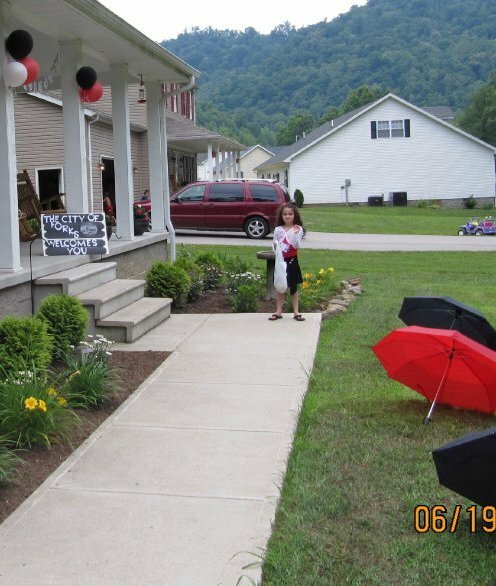 Red and Black umbrellas welcomed guests to the "SHOWER" and created a fun look in the yard of the house that we were having the shower at. The entry table was decked out with red and white roses. 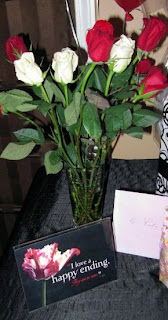 In fact, one of the bridesmaids bought 4 dozen roses to place all around the house for the shower. They were beautiful. 1.) We setup several tables. 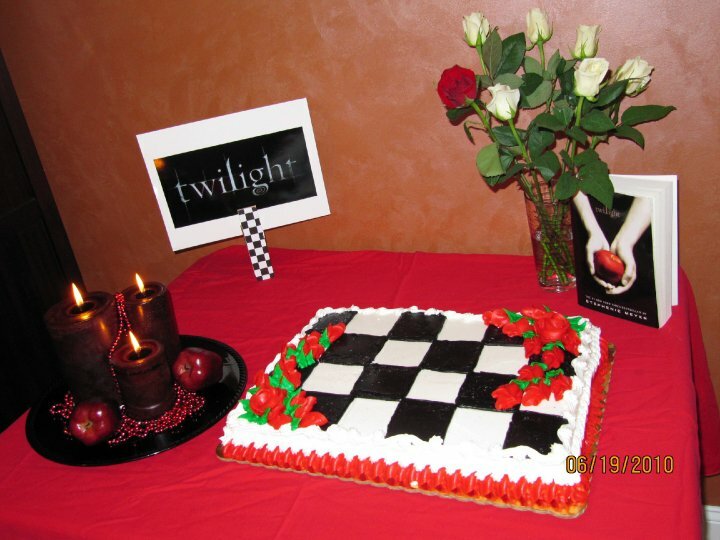 At each table we decorated with one of the twilight books and the icons from the front of the book. On the cake table we decorated with the first book. We had the book on the table along with some candles and apples. The cake was decorated in a checkerboard patern with red roses. 2.) I also setup a red/white/black candy buffet. That table was setup with the last book. 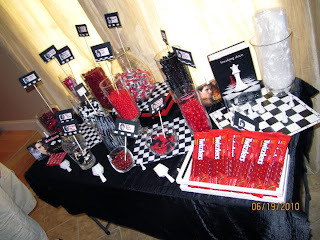 It had a dollar store chess board and chess pieces scattered about, some felt black and white checked pieces under the candy containers and the book. 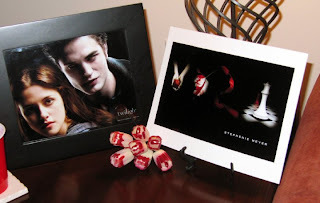 I also created twilight labels with jacob, edward, and bella's pictures on them to identify the candy. I bought red twizzlers, black twizzlers, boston baked beans, white and black m&m's, red hots, twizzler bites, cinnamon disks, peppermint disks, root beer floats, red airheads, black and white gum packs. 3.) 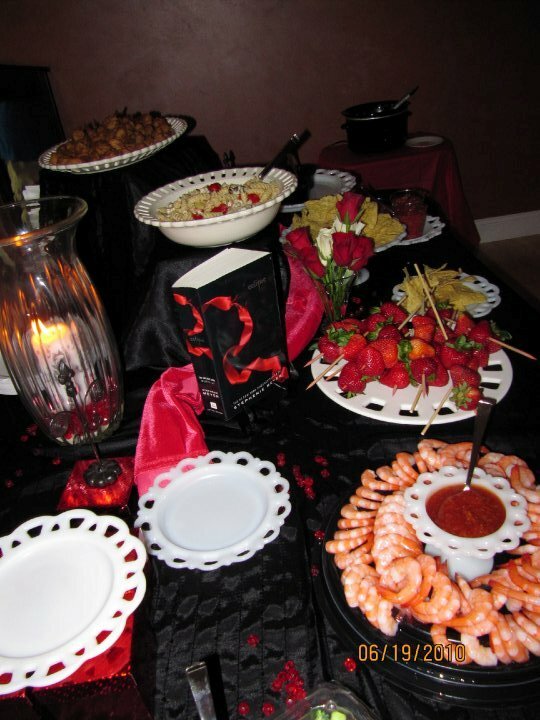 The food table was setup witht he Eclipse book cover in mind. We covered the table in black fabric and used a piece of red fabric to weave through the dishes. some of the food was propped up with boxes. We just layered the same black fabric on top of the boxes to make it look more seamless. We used all white dishes to pop against the black fabric. We took red beads and scattered them around the table. We also had the Eclipse book on this table. 4.) The last book theme table was the gift table. We used the same black fabric for this table and used quotes from the new moon book for this table. We printed these quotes from the hostess with the mostess website. We also used printables from this website for the drink labels. A couple other things we did was take quotes from the movies and books and created posters to hang up around the party. We printed pictures of Edward and Bella and Ricky and Kristen that sort of matched. 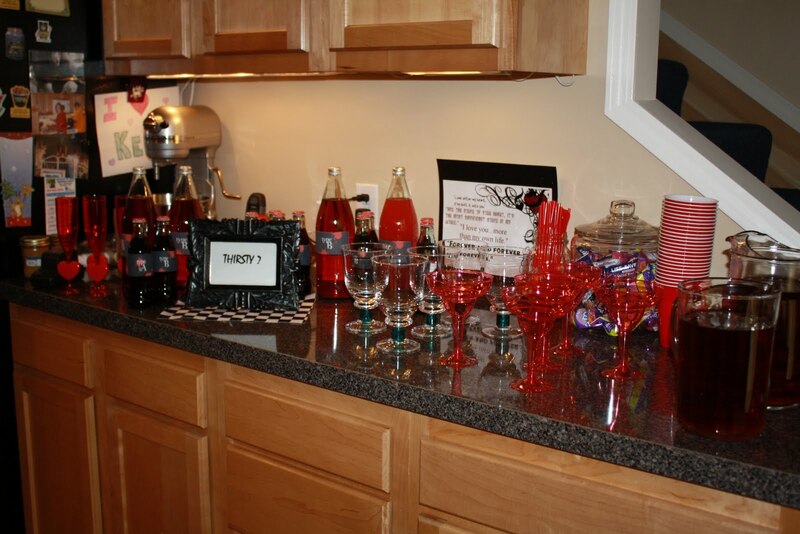 We also had a fun drink bar setup. 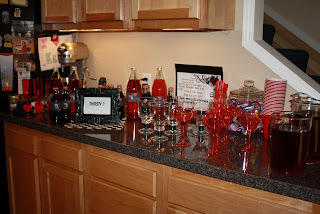 We had red bottled drinks with great labels(found at hostess with the mostess) and some mini coke bottles, iced tea, margaritas, and of course bloody mary's to drink. For favors we gave umbrellas to everyone. I told everyone it always rains in Forks so please take an umbrella. Everyone seemed to like them and I got them at the dollar store for $1.00 each. 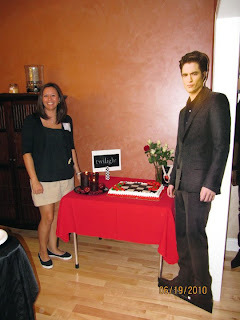 For the games we played twilight/bride and groom trivia. I matched up questions for example. What is Forks High School Mascot. And What was the bride and grooms high school mascots. When everyone came in the door I had them draw a name tag out of a hat. On the nametags they received either a team edward or team jacob tag. Both teams were split and asked to answer the twilight and bride and groom trivia questions. Whichever team got the most questions right won eclipse gum. I made labels for the eclipse gum that said "twilight eclipse". 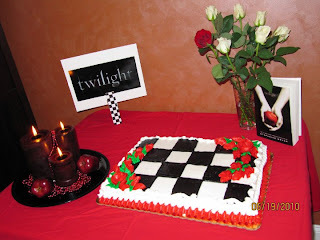 We also plaid twilight bridal bingo and the clothespin game wehre you couldn't say Kristen, Ricky, Edward or Bella. All in all it turned out to be a great shower and the bride really loved it. Last weekend I was walking around Lowe's and I noticed a sign that said Kid's workshop - build a bird feeder. I've seen the sign before but my daughter was always too young so I have sort of blocked it out for years. Well my daughter is seven now and that sign screamed our name..so we went for it. We packed up last weekend and went to Lowe's to build a bird feeder. It was a great time. It took about 30 minutes to complete and she was given a little patch that said bird feeder to put on an apron. Apparently they give a patch for every project (such a cool idea). We have already signed up for the next 2 projects online. I highly recommend this fun free activity. Although I can tell you the thought of my daughter hitting her finger with the little hammers they provided did cross my mind...but she did it all herself and didn't get hurt or anything. I guess I must admit that she is growing up :). While we were there a group of scouts came in. What a great activity for them to do together...did I mention it's free...How cool is that! Here is the link where you can sign up for the Lowe's build and grow clinics yourself: http://lowesbuildandgrow.com/ . Next week we are building a school house and the week after we are building a garden trellis. They also have a few kits you can buy online and here is the link to that: http://www.lowes.com/pl_Kid%27s+Building+Kits_4294825296_4294937087_ So which brings me to my point on how this could be a kids party idea. I went to the home depot website and searched for kids workshops and it brought up a link that has bulk kits that you can buy (12 sets in each kit and a little home depot apron for each child). How fun would it be to have these kits at a construction party as an activity or even a garden party (for a bird house). The price is $95.00 for 12 kits which did I mention contains the cutest litttle orange home depot aprons. The price seems a little steep until you figure out these are the favors for your party too. So you would get a great activity and a favor all in one that isn't junk(I just hate giving junky favors that will end up in the trash). I think it's fabulous! 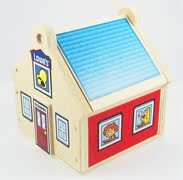 To find the kits just go to http://www.homedepot.com/ and search for kids workshops. They are having one this weekend. I'm not sure if we will have time for both but it looks like a great project. Even if you don't do this for a party I hope you will get to go to a workshop and have a great time! Happy building and partying! Please let me know if you know of any other places that offer free workshops and things like this for kids - we've got the bug now. While trying to find ideas for crafts for Valentine's Day for Natalie's class I stumbled up on this great "faux" Bubble Gum Machine. If you were having a Candy Themed Party I think you could make this as a craft, or make them a little bigger and use them as centerpieces or just make a bunch for take home favors. 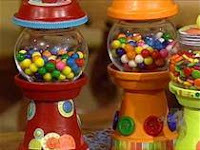 Since you can buy flower pots and glass fish bowl type pieces in so many sizes you could have a lot of fun with these. If I can find enough glass vases I might put together a craft for Natalie's class....or maybe I'll just make an extra big one for the classroom and fill it with goodies for the goodie box to give to the teacher for Valentine's Day. This example was found at the following URL: http://www.ehow.com/how_5085500_make-machine-out-flower-pot.html and it has instructions on how to create your own. 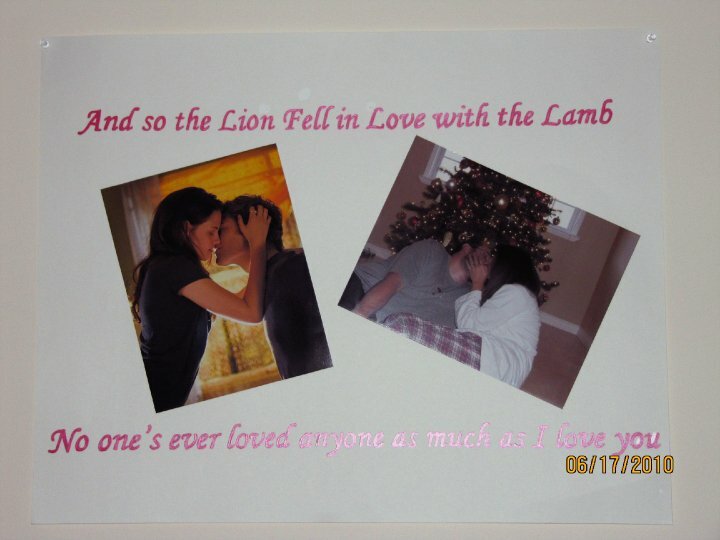 This example was found at http://twopeasinabucket.com/ after I searched the Gallery for Valentine's Projects. Now that Christmas is over I have been brainstorming Valentines Day ideas. I will use some of these ideas for my daughter's 1st grade class valentine exchange, some for snack days at School, and some will be filed for later years but I wanted to document them on the old handy dandy blog so I didn't lose them. 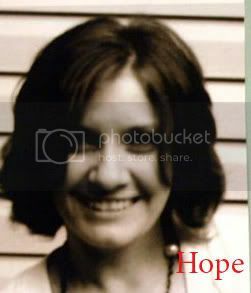 After searching the net for Valentine's ideas I highly recommend the following website with lots of pics and great Valentine ideas - http://skiptomylou.org/ I particularly love skiptomylou's "Bomb" Valentine and intend to make some this year but instead of bath bombs I will most likely filll with candy for my nephews class. Example and Pic created by Skip to My Lou website. Below I have some more ideas for Valentine's fun and I will post pics as I make them. If you decide to make some of these ideas I would love to see your pics. "You Rock Valentine" - Gather Rocks, paint them, and write "You Rock" on the rock with a sharpie. I think this one would be great for a boy valentine exchange. Could also use this saying with pop rocks candy as well. "Your Dynamite Valentine" - Make some dynamite with pretzel rods, red chocolate and red twizzlers and create a tag that says "Your Dynamite Valentine. Wrap 3 pretzel sticks together with string twizzlers and place in ziploc with the tag. Make sure you make a wick for the dynamite. "Stick with me Valentine" - Get some valentine stickers and put them in a little baggie and attach a label that says "Stick with me Valentine" or you could do sticks of gum. "Your my main squeeze Valentine" - Lemonade caprisun with a tag that says "Your my main squeeze" - or for teacher a stress ball with a tag that says "Your my main squeeze"
"You color my world valentine" - A bag or box of crayons and a coloring page of a globe with a tag. 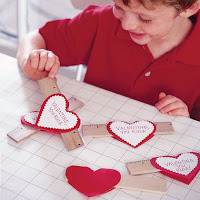 "You complete me Valentine" - A picture of your child cut into 4 or 5 puzzle pieces in a bag with a tag. Example created by me. "You have a heart of Gold Valentine" - Gold foil wrapped chocolate hearts in a baggie with a tag. "You Rule Valentine" - A small ruler with a tag. Idea and pic from Family Fun Magazine website. "You suit me to a TEA Valentine" - Tea bag in jewelry sized baggie with a tag. "Poppin by to say Happy Valentine's Day - Microwave Popcorn with tag. 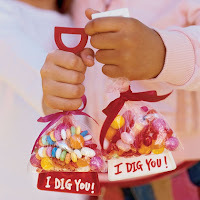 "I dig you" - Shovel with Candy - idea and pic from Family Fun Magazine website. "I'm banana's over you Valentine - Banana with tag. "You make me float Valentine - Balloon with tag. "I'm nuts for your Valentine" - Individual bag of nuts with tag. Example created by me. "I'm a sucker for your Valentine" Sucker with tag. "We connect Valentine" - Individual connect 4 candy favors(found at Toys R Us) with tag. We attract each other Valentine. magnets with a tag. "Glad to BEE your student" - Honey with tag attached. "There is only one thing that could make you a cooler Valentine - Ice Cream GC with this tag. Please let me know if you like these ideas or can think of any others. If you create some of these items I would love to see them. Once I get out of the house, I'm snowed in at the moment, I will be creating some of these so check back for pics. Yeah...I finally have another party to post about....Last weekend we had a monkey birthday party for my 7 year old daughter. We had a great time and did lots of Monkeying around. The birthday invitations started at school with a snack and and an invite. I used the containers I bought for the party banana split party and packed in a banana and the invite. Super cute and easy invitation. The little "fake" bananas were sent to those that were not in Natalie's class. We decorated with lots of banana and monkey themed items. I created fake palm trees out of wrapping paper rolls, balloons, and green posterboard. I stuck dowell rods down in some round flat foam pieces and placed the wrapping paper rolls over them. I then placed monkeys around the trees and placed bananas around the table. I found a few fake plants to tie the yellow and brown balloons too and used green, yellow, and brown for tablecloths and accent colors. I bought green, brown, and monkey printed fleece when it was on sale and created simple scarfs for one of the take home goodies. The looked great around each of the chairs and even the adults liked them and took one home. 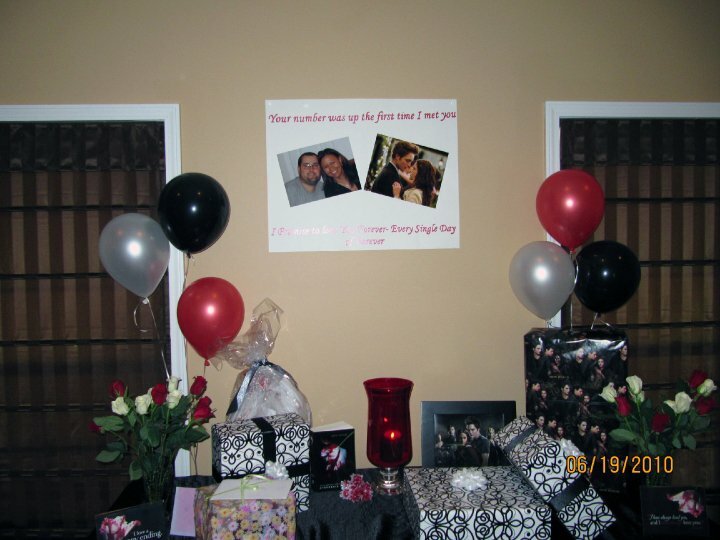 It was a great alternative to the tulle seat decorations and it was something usuable. The best part is I made 30 of them in about an hour and it only costs me around $10.00. We also had a banana split bar. I used an old crate I had laying around to place the bananas on and some baskets as well. It turned out very cute and it was the hit of the party. I found some monkey sucker molds and lots of fun stuff from oriental trading to dress up the tables and the kids...lol. We had a monkey coloring page out on the activity table when the kids got there they could start coloring. After they were done we hung them up on a clothesline with clothespins to display and for more festive monkey decorations. The goody bags were just plain brown lunch bags with welcome to the jungle wrote on them. I think they looked really cute lined up together. I also saved up toilet paper rolls for months so the kids could create binoculars at the party. We had a monkey dance contest with some songs my friend downloaded for me from madagascar 2 soundtrack. We also played bingo. It turned out to be a great party. 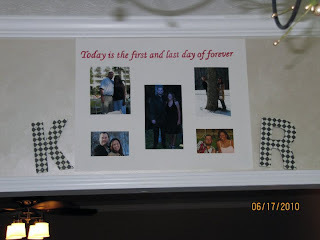 I hope you enjoy the pics and are inspired for your next party. I have to say it.........I'm glad Halloween is almost over. I'm worn out. We had a big halloween party last weekend and Natalie is on her 5th costume tonight (2 of which I made). We had a great time at the halloween party though. The kids all looked so cute and we had lots of goodies, games, hay rides, picture spots, and food. Although at the end of the party everyone decided that Jumping on the trampoline and playing in the leaves at the same time was a good idea. 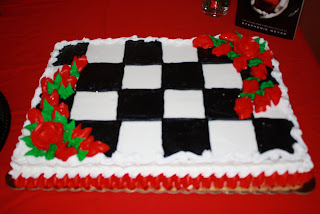 I asked my dd what her favorite part was...I knew it had to be the games I worked tirelessly on or all the goodies I put together for the dessert buffet or the great hay ride the neighbor put together for everyone....but guess what she said. Jumping on the trampoline. Can you believe it? That wasn't even on my plan for 2 months ahead of time. Just goes to show you sometimes fun just happens without being planned :) Who would have thought. I could have just invited them got my pictures, picked up some pizza and threw them in the trampoline. Oh Well...I'll put that on my plan for next year. 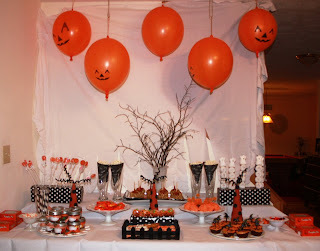 I saw Amy Atlas halloween dessert buffet in a magazine and it went straight on my list of fabulous things to do for the halloween party. I realized mine would not look as glamorous but I think it turned out darn cute and if I could have found a wall that would have given me a seamless background in the house it would have even looked better. Although I did get reprimanded by my dh for putting thumbtacks in the ceiling after the party(I told him that's why I did the setup at midnight the night before when he was fast asleep..hehe) To setup the dessert buffet I took my buffet cabinet and another lower cabinet I have and placed them one in front of the other. This made the dessert buffet wider and it varied the height slightly. I then took boxes and wrapped them in black and white polka dot paper and pulled out all my white dishes for the orange, black, and white foods. I collected candies and items that were in the orange, black, and white color family all during September and October when I was out shopping. For the centerpiece I sprayed some branches black and placed them in a white vase. I also took some flower cones and painted them orange and placed black paper mache dots all around them and put some black pipe cleaners in the top of them. The balloons were from oriental trading. They are the pumpkin punch balloons. For the actual food I only made a couple of the items and the rest I purchased. 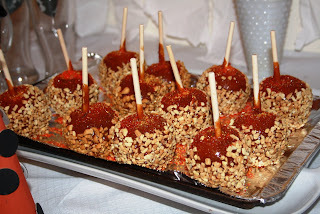 The homemade items were the coconut balls, chocolate covered pretzel sticks, and the caramel apple(well my sister in law made those! Thanks Amy!) The rest of the items were purchased...the white donut and peeps ghost skewers, reece cups, m&m's, pumpkin suckers, smal pumpkin pies, and chocolate cream with orange icing cupcakes. All in all I think it turned out great and everyone loved it. I'm already dreaming up my christmas buffet idea. Next, since I feared it was going to rain the day of the party I took all the games and placed them in my husband's basketball dome(don't ask). The dome actually came in very handy and I think we will have the games in there from now on. I had them lined up against the walls and instead of pumpkin bowling(since I didn't think the pumpkin and the concrete floor would cooperate) we used a basketball to knock down the bottles. We also had a small baskeball hoop for a hoop shoot, a tub full of sand and bones for a dig for bone game(small children love this one), and a duck pond. The other games we had was plinko(oriental trading), spider ring toss(oriental trading), bottle toss(oriental trading), punch out, and a bean bag toss. I used the same bean bag board that I had painted last year. My mom graciously made 4 bean bags for each person and the party and I found halloween buckets at Michael's for $.79 cents so everyone would get a bean bag game to take home with them. Each game had individual goody bags or tickets you could win. And of course we had a pinata. It took forever to get that thing to bust. After everyone played the games we took pictures in my homemade spooky picture frame wall. I think the parents enjoyed this just as much as the kids. After all the excitement of the games was over I led the children with their tickets to my makeshift ticket table. I set it up sort of like chucky cheese and they got to pick their prizes. They seemed to like this and it was funny the things they picked out. We then ate goodies, went on a fabulous hayride, and then we took a group picture and they jumped on the trampoline while playing in the leaves. Overall it was a big success. Natalie dressed up as a bee, my dh dressed up as a Buzz the beekeeper, and I dressed up as a Vampire. I'm always looking for something to put on 20 minutes before everyone arrives. This year it was throw on some face paint, rip up a white shirt, and put blood all over me. Maybe next year I will actually plan for me an outfit :) I hope you enjoy my party details and can use some of these ideas for your parties. Let me know what you think and let me know if you have any ideas for next year. Copyright © Craft Party. All rights reserved.